Inducted into the Pipe Tobacco Hall of Fame, Prince Albert Pipe Tobacco is an American standard that been a staple brand of high quality pipe tobacco in the United States since its introduction in 1907. Prince Albert is an air-cured, burley tobacco. A special feature of Prince Albert is the, “Crimp Cut”, it’s called this due to its way of burning slow, cool and mild, and down to dust fine ashes. Prince Albert Pipe Tobacco gives off a room note that is pleasant, sweet, and crowd pleasing. This premium tobacco commonly draws remarks like, "Mmmm! My grandpa used to smoke something that smelled like that!" Packaged in an old-fashion but nostalgic style, Prince Albert Pipe Tobacco is sold at a discount online price in both luxury pouches and plastic tubs. Each are perfectly constructed to keep this high-grade tobacco consistently moist and fresh for long periods of time. So give Albert Pipe Tobacco a try, and as you smoke think of the countless number of grandfathers who lived off of the stuff. It'll bring a smile to your face, as the wisdom of the ages awashes your senses. 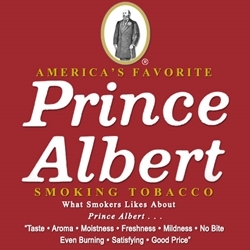 Prince Albert Pipe Tobacco is produced and distributed nationwide by John Middleton Tobacco Company, Limerick, PA USA. Each pouch of Prince Albert Pipe Tobacco are available at our online tobacco store in unique styles to choose from. Currently available: Luxury Pouches and Regular Flavor in a 14 oz. Plastic Tubs. Here at Smokers Discounts we offer you a great way to relax and enjoy a great quality smoke at an inexpensive price. Prince Albert Pipe Tobacco is an excellent choice for your money saving needs. Our online tobacco store was created to make it easy and affordable to buy pipe tobacco online. Call us for more details!